This guide is designed to help you get your content updated as quickly and as accurately as possible. CONFIRM: After the web team sends you a link to the new web page(s) for review and any required editing, you confirm that the pages are correct. You are the “subject matter expert” for your content. You know your area of responsibility inside and out, and know what information you need to get out to the world. As such, we count on you to provide the content that you need presented online. The web team specializes in taking content and formatting it in various ways to make it convenient and accessible online using a variety of techniques and technologies. There are over 15,000 files on our web site. It takes a lot of work to make sure that the site stays up and running properly. The formal process helps us to manage the updates to all these files to ensure that we stay in conformance with the accrediting agencies, federal, state and local laws regarding accessibility, FERPA regulations and many other requirements for online content. Without a formal process in place, content changes often end up being made “stream of consciousness” where pages get edited, frequently many pages at a time, and the normal editing process gets subverted as content changes are made free-form. When changes are sent in a non-trackable way (ie: a PDF instead of using a Word document with the Track Changes function enabled) we have no way of knowing what content on the page has actually been changed. The only way to “standardize” the site after free-form changes is to go through the entire section of the site again with a new editing cycle and check every link and phrase for consistency, which is a very long, tedious and error-prone process to do, especially if it has to be done many times. It usually takes longer and requires more scheduling coordination. The formal content process lets you work on your own schedule, send it to us, and allows us to work at our own schedule to get your content up. The more formal content process listed above saves us both time and aggravation resulting from free-form content creation. Why doesn’t the content on my web page look exactly the same as the document I gave you? Formatting for the web is different than formatting for printed paper. When formatting for print in Word, Publisher, etc. you have complete control over everything on the page. On the web, however, the rules are different. Every computer, web browser, operating system, screen size, browser windows size and font size may be different, and as such we have to make certain assumptions and tradeoffs to ensure that your content will be available to the widest possible combination of settings that visitors may have. This often means that images are resized, certain text effects (especially custom fonts and underlining) are changed or removed and the flow of paragraphs may be different when the content is reformated for online use. Can I just make all my pages PDFs? Unfortunately, No. However, we will work with you to convert the information in the PDFs into a format that works better on the web site. While Adobe’s Portable Document Format (PDF) files allow print-quality control over the content, it also makes it more difficult for users to view the pages online and on mobile devices, reduces the accuracy of search engines in finding your content, and renders your content less user-friendly overall. For those situations where you need a printable version of certain content, we can include a “Printable Version” link on the page that will allow users to print out your pixel-perfect version if they wish. However, the content in the PDF should also be present on the page that this link comes from for users who cannot or prefer not to use the PDF version. Can you put “Under Construction” while I’m working on the content? Unfortunately, No. We can’t put up content that doesn’t exist, and that’s basically what an Under Construction type of page does. It is considered bad practice to “sort of” put up content. Either the content should be present on the page; or the page should not be up at all. In addition to the bad practice aspect of this, experience shows that people tend to forget about getting their content up once they know that a page of any kind exists, and then the “Under Construction” page is never updated, which looks bad for everybody involved and frustrates people trying to find the information on the site. 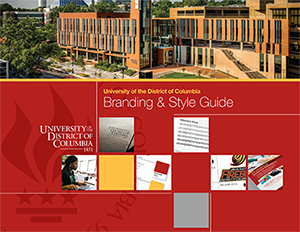 Click here or image below to view Branding & Style guide.